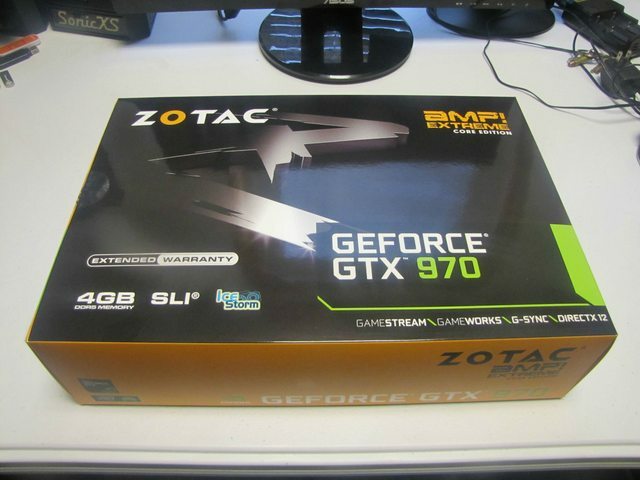 From my good friends over at Zotac, I received a GTX 970 Amp! 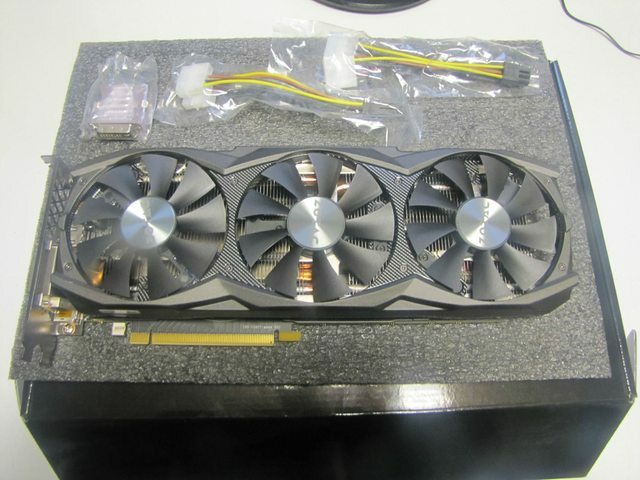 Extreme Core edition graphics card to review. I would first like to say, as most know how I review, my computer is setup just to game, it is not optimized in any way to get max performance out of every last piece like disabling things to get a fraction more out of it. It is not a fresh install of windows, I use this computer to game on like an everyday computer to bring a feeling of a end user usage. Dimensions (L x H) 11.79" x 4.38"
The core edition removes things such as size from the Amp! Extreme from extra features that needed to be in place, OC+ feature and the Light.id. 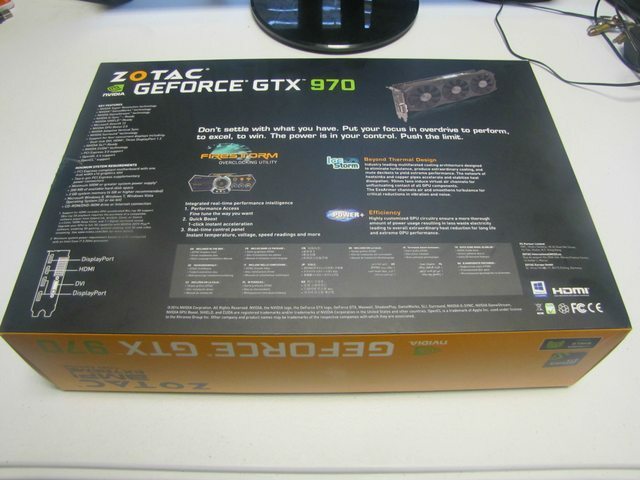 Starting out, Here's the front of the box, Noting their extended warranty, some Nvidia features and DX12 support, of course also their Ice Storm cooling. Flipping it over, you see on the left the Key Features, and the Min System requirements. Alongside that you have the Firestorm Overclocking/Monitoring utility, Ice Storm cooling being described, and the Power+. Opening up the box, you see the graphics card, TWO 2xmolex to 6pin, and a DVI to VGA connectors. 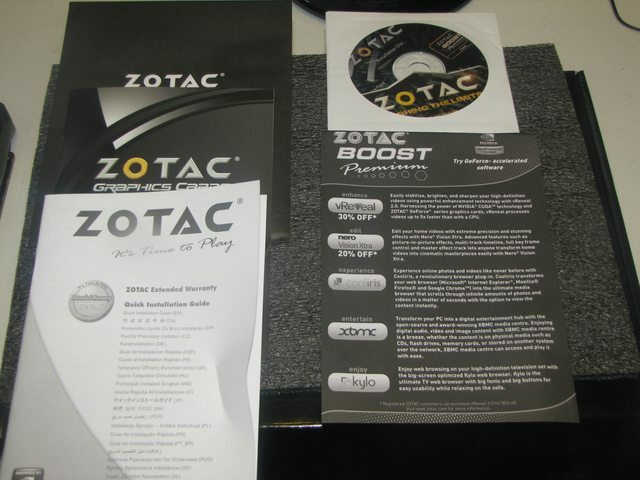 Additionally included is the Zotac Driver CD, Quick installation guide, A pamplet/discount paper of some geforce accelerated software Zotac has been behind for years, with also a Case Badge/sticker. With the GPU by itself, showing off the face with carbon ExoArmor With it's plastic shield and the Zotac logo on each 90mm fan that gives off great airflow to keep this beast cool. Note: After hearing back I found out... "The front fan shroud carbon ExoArmor frame is actually made of metal however, the parts with the carbon fiber detail is plastic." However I thought it was mainly plastic due to the paint how it felt. 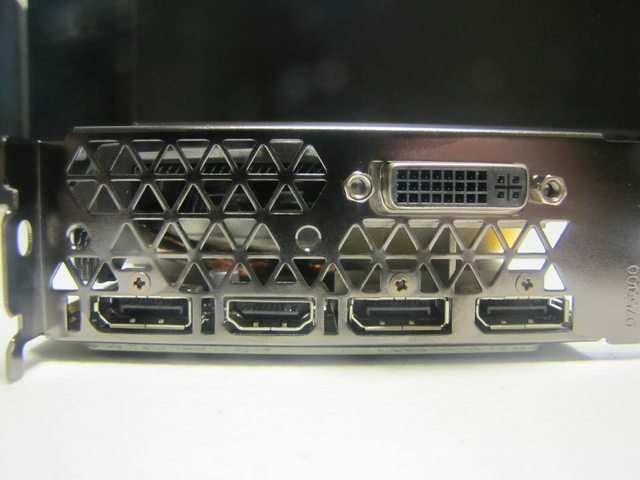 Looking at the most common visible piece from the GPU when installed in most standard cases, you see the Zotac logo which illuminates in white when operational, and two 6pin connectors instead of the dual 8pin connectors from the Amp! Extreme edition. 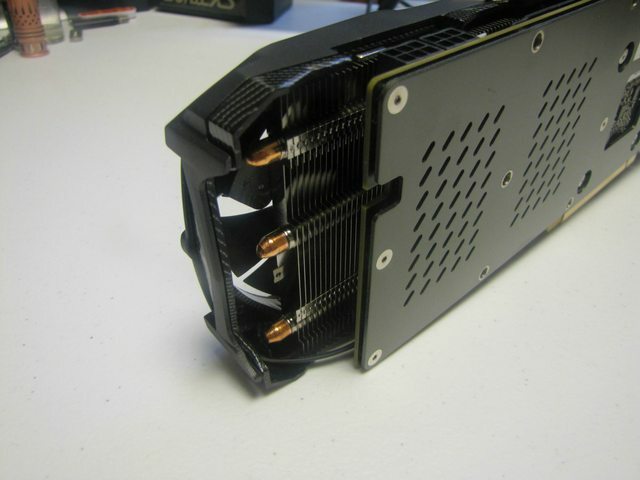 On the backside, you have a nice slotted gun metal looking back plate for the GPU that also will help cool the card and prevent sagging. Also looking you can see 3 Copper heat pipes running along the back you can see visibly out of the 5 total, and aluminum fins giving it full coverage. Then to the connections, You have 3 Display ports, 1 HDMI and 1 DVI-I connectors. Regarding Testing, I am keeping this stock as there are a few reasons to this. First would be, it is the highest factory overclocked GPU on the market I have seen so far, so I only want to test what you get out of the box. Second would be that I am not a overclocker, I am a gamer who wants it to run right out of the box as that how most people I know plan to use their gpu for years, until it gets old. Opening up firestorm, you can see the Default, 2D, 3D, and 3D+ Settings that came with the GTX 970 from Zotac. Pushing the card to the limits of constant use and having an ambient temp of 22C... My card temperature was 22C idle. With firestorm on Default settings, after running benchmarks, Gaming, and even what I like to do to get my highest temperatures from a GPU via Furmark stress testing. After all the stress I could not hit the 60C mark after a good frame time of straight stress testing with a max fan speed of 64% from the stock 60% which was on AUTO. Shocking me, as temperatures rose up stopping before 60c the card did not get louder based on the profile it has at stock. Ramping up the fan speed to 100% it was still quieter than a standard case fan thanks to the 3 fan design which over the years has been one of the quietest graphic cards I personally heard. While I can’t compare with noise equipment, I am sure no one would have a problem with this. Getting into some Gaming, Below I posted screenshots of the settings for you to see what I was running at. I rarely play games outside my typical, and knowing how demanding Metal Gear Solid: Ground Zeros, Battlefield 4 were, I also threw in The Evil Within, as those are games I played recently and enjoyed and expect to see my actual performance there. 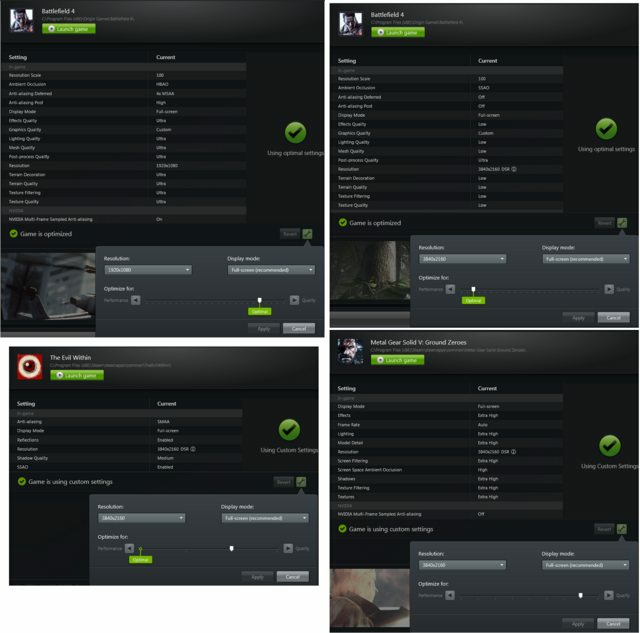 For Metal Gear Solid, and The Evil Within, I ran these at 3840x2160 DSR, As these games have no problem running 1920x1080P max settings, But I wanted to stress the card out and still playable. Both games have 30fps Lock limit, and this is what I shot for as based on the pic above, slight changes to allow that playable framerate. Adjusting those settings, only things in the game that extremely seemed breaking the card graphic wise would drop the frames below the 30FPS mark. Battlefield 4, I wanted to get some sort of same 3840x2160 gameplay at 60fps without any huge dips below 30fps to keep it multiplayer playable, Also I threw in the 1080P test at Max Settings. 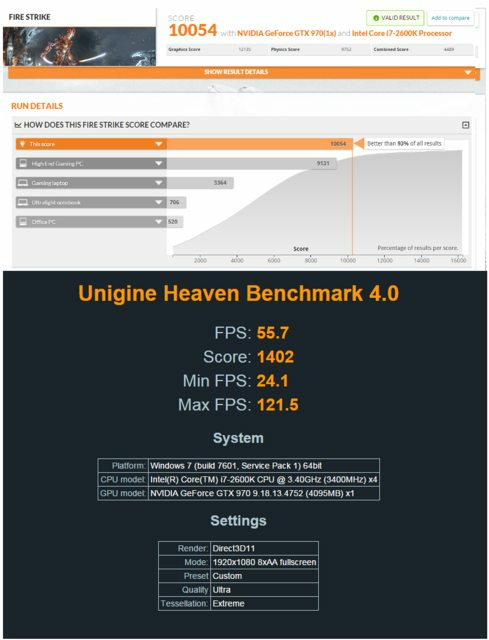 Synthetics ran were 3Dmark and Heaven Benchmark just to give you anything you would like to compare to, as I am not a benchmark fan, but I do still provide it to let you compare. One thing I would like to note is that the Firestorm application is still a bit buggy, such as applying settings on the card. Even though you hit apply, and it asks if you accept, it automatically puts it at those settings, it does not wait for you to hit accept or cancel so if you hit cancel those settings are still applied. 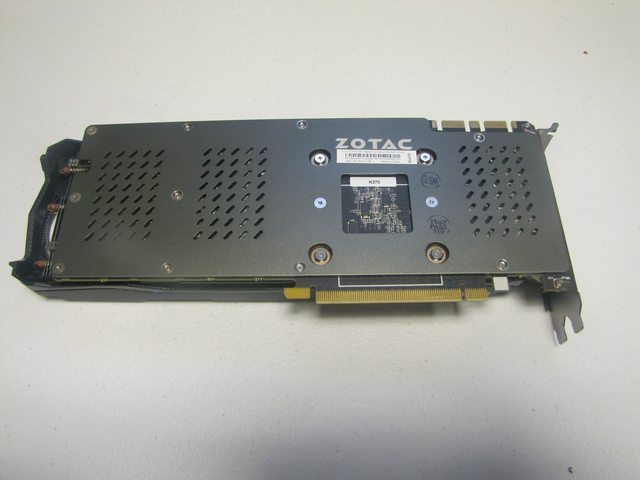 In the end, the Zotac GTX 970 Amp! Extreme Core is the fastest factory overclocked GTX 970 graphics card out of the box that I have seen yet, coming in at around $379.99. As those like me I prefer to buy factory Overclocked cards, for being inexperienced with overclocking. 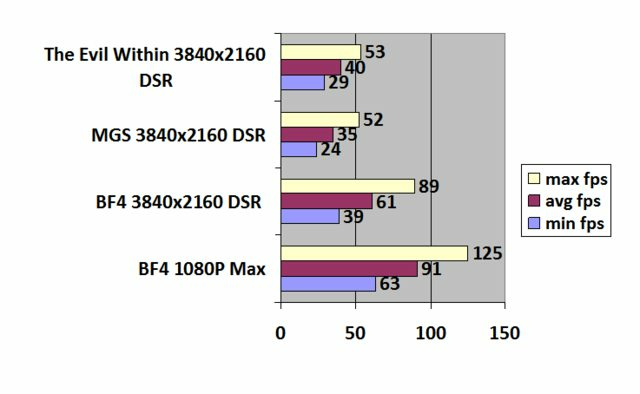 The performance, though I have no 4k monitor to test with, from what I can see will allow a single card to get near max settings on some games at 30fps via DSR or possibly a 4k monitor depending on the game. Games that you see often played in e-sports like Dota/LoL, SC2, cs. Ect should see no problems running with this graphics card even at DSR settings or 4k without much tweaking if none. This card may not be for everyone due to the length of the card, but should you be able to fit it, you will be happy you did. Wishing I had more games to test this card out, Even at 1080P some games are just graphically demanding like Battlefield 4 and this lets you even max these games out. Though you may still have to tweak a setting down for your 120hz/144hz monitor refresh rates which some of us do anyways in games. Which brings me to 1440P. This graphics card will be able to handle games at 1440P though I didn’t test it with a 1440P monitor. You can also get some serious 1440P DSR going too incase the games you want to play can’t run a smooth frame rate from the 3840x2160 DSR which I recommend for more detail and higher frames. At the cost of lower resolution. 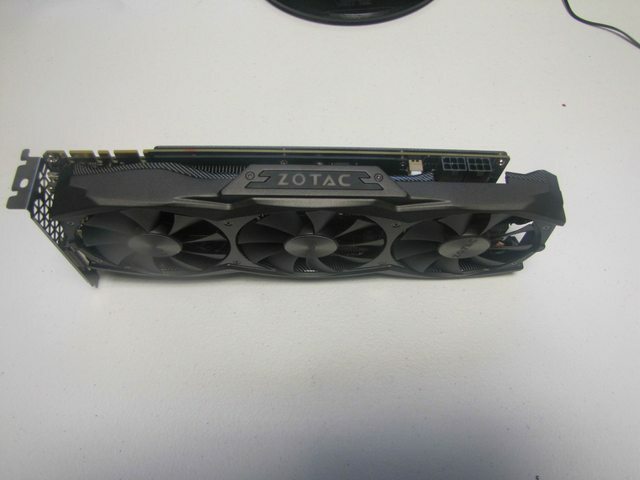 Overall, as a single card I think the Zotac GTX 970 Amp! Extreme Core Edition is priced fair at the performance it gives, and operation it does. 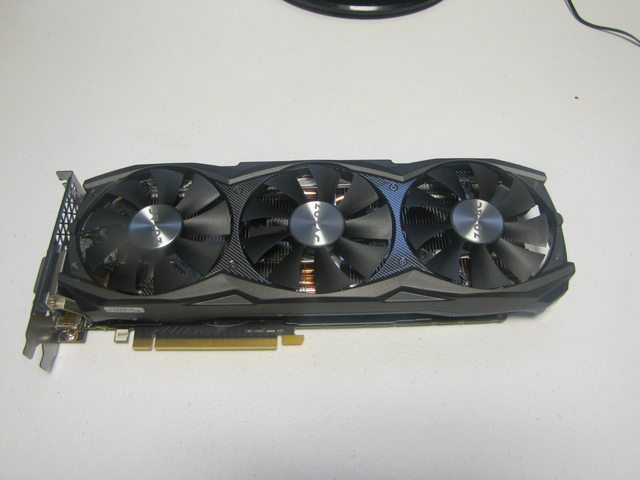 There should be no doubt about this card when looking at the 970 series. If I did not receive this for review, I would have purchased it and recommended it. Rated, I would give it a 5/5 as it has everything I would want from a factory overclocked card. 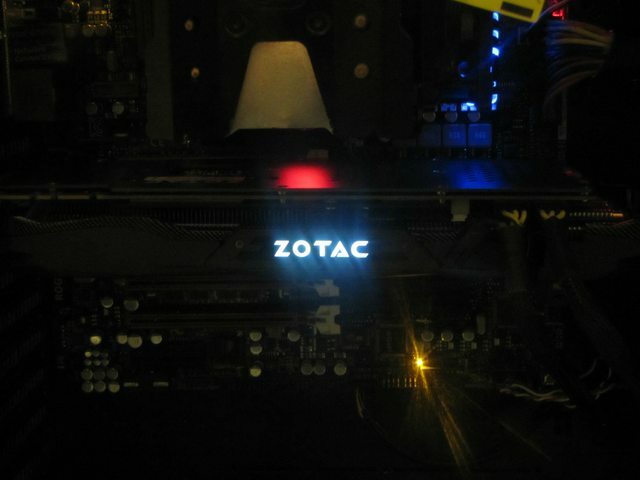 Finishing off this review, who wouldn't like to see the illuminated Zotac Logo? Last edited by Forcefedflesh; 01-04-2015 at 18:26. Sweet looking gpu. doesnt those amp version cost almost the same as a 980? haha it's no problem, heck, it can even save ya some money when shopping from newegg to notice the seller as usually they are more expensive than newegg by 20% or more. What kind of reputattion does Zotac have? I've only bought EVGA and Asus (and nVidia rather than Radeon/AMD) for the last 15 years so I've not paid a great deal of attention to other GPU manufacturers. Zotac has a pretty good reputation, I personally never had a problem, and as well as their products. Though some choose to go with EVGA/Asus/Gigabyte ect. for certain things, They also choose Zotac for Specific reasons as well. Zotac has been in the business for some time, from motherboards, to gpu's to mini pc's and other accessories from time to time.